is to assist parents in passing on the Faith to their children. The entire school community is dedicated to providing an atmosphere which will help students deepen their relationship with Jesus Christ and with the Church. We also realize our commitment to the formation of the whole Catholic-Christian person. To that end, we seek to form students who will understand the relationship between Faith and daily life, and who will understand that the Church cares about them and their world. Additionally, we recognize the freedom of each individual in seeking the Truth. In accord with Catholic principles, the student will find at St. Edward the proper balance between freedom and Authority, both of which are necessary for healthy Christian maturity. To provide opportunities for students to meet Christ and to deepen their relationship with Him. To help students come to a fuller appreciation for their Catholic Faith and the role of the Church in their lives. To help each student strengthen his/her Catholic commitment by providing: a Catholic atmosphere in everything that we do, annual retreats, courses in Theology, and opportunities for Apostolic service. To offer each student the opportunity to mature in: Catholic witness, meaningful personal relationships, Apostolic service, and community leadership. To help students grow into an adult Catholic Faith: one of reverence for God and His Church, love for Christ, and respect for self, others and Creation. To help each student discern what vocation God desires for them, in keeping with the student’s interests, abilities, and personal inspirations. 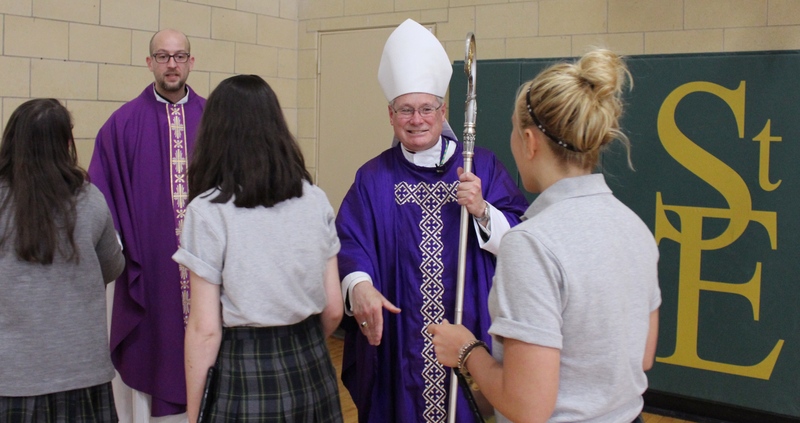 STUDENTS AT ST. EDWARD CENTRAL CATHOLIC HIGH SCHOOL ARE REQUIRED TO ATTEND ONE RETREAT PER YEAR WITH THEIR CLASS. All seniors are required to attend a Kairos retreat, which is three nights and three days. Kairos retreats are off campus. The juniors will attend a two-day/one-night retreat, which is held off campus. The sophomores will attend a two-day/one night retreat off campus. The freshmen will attend a one-day retreat. The fee is listed on your tuition statement. Participation in the retreat program is a mandatory requirement for graduation. Retreats at St. Edward are a priority, and take precedence over all other school related activities.